See how heat pump water heaters work and how ENERGY STAR certified models can help you save on your utility bills! 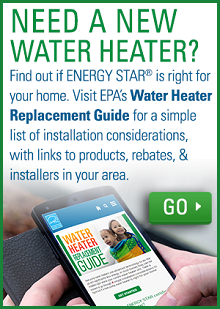 Watch "ENERGY STAR Water Heaters Mean BIG Savings!" Consider an ENERGY STAR certified heat pump water heater (HPWH) for your next water heater purchase and enjoy big savings, a smart investment and a product that protects the environment. Please see the Heat Pump Water Heater Factsheet (PDF, 69 KB) that explains the savings opportunity. 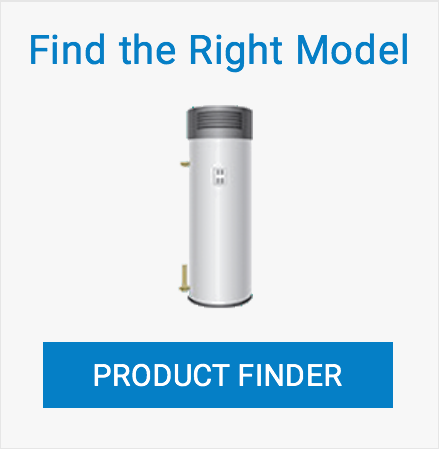 What else should I look for when buying a heat pump water heater? Where will it be installed? HPWHs should be installed in interior spaces that remain between 40° to 90° F year-round, and provide 1,000 cubic feet of air space around the water heater. They generally don't operate as efficiently in colder spaces, and can cool the spaces they are in. If possible, consider installing in a space with excess heat, such as a furnace room. In colder environments with lower incoming water temperature HPWHs may need to go temporarily into a back-up standard electric water heating mode to meet household hot water use in colder months. This will increase energy use during these months. Please see the Considerations section for more details on issues to consider when installing a heat pump water heater. Estimate the capacity you'll need. Use the gallon capacity of your current storage water heater, if you already have one, as a starting point. You can find the water heater's capacity or volume on its nameplate or yellow Energy Guide sticker. This should help you discuss the sizing of the water heater with contractors. You may want to purchase a larger unit if you have added or are planning to add more occupants to your household or a new shower, faucet, dishwasher or washer that will be in frequent use. A contractor or retail salesperson can help you decide if a larger model is necessary. Don’t forget about maintenance. HPWHs may also require annual maintenance, including changing air filters. Please review the manufacturing operating instructions, or as your contractor for direction. Other Considerations. ENERGY STAR certified HPWHs, in addition to heating water, can provide additional benefits. During hot humid times of the year, the water heater can help cool and dehumidify the space it is installed in. Need a new water heater? Ask for ENERGY STAR. Water heaters are the second highest source of energy usage in the home. A new ENERGY STAR certified heat pump water heater can save $300 a year in energy costs plus even more with rebates now available from participating utilities. All this adds up to big savings for you and the environment. Don’t wait until your old water heater fails. Warm up to savings with ENERGY STAR today! If all residential electric water heaters sold in the U.S. were ENERGY STAR certified heat pump water heaters, we would save more than $11.8 billion each year and prevent 140 billion pounds of carbon pollution annually. This is equivalent to the emissions from more than 13 million vehicles. If electric is your only option, an ENERGY STAR certified heat pump water heater uses half the energy of a standard model and can save a family of four up to $3,500 over its lifetime by heating water using highly efficient heat pump technology.